PAXsims is pleased to feature a contribution from game designer Brian Train on a political-military issue that has received relatively little attention to date from published boardgames: the military coup d’état. When I was a boy, there were certain books on my father’s shelf that I found interesting, first for their covers and then (once I’d opened the book, for that is what a catchy cover is intended for you to do) for their content. One of these was Coup d’etat: A Practical Handbook, written in 1968 by Edward Luttwak. The image of a tank bursting through paper was an arresting one, and is one I still associate not only with military revolt but with wargaming in general for some reason. I tried to read the book several times, but it wasn’t until I had broadened my reading and understanding of politics, as well as starting to play wargames, that I began to appreciate this at once very pragmatic and very cynical book. About twenty years ago I was living in Japan, doing the teach-English bit. 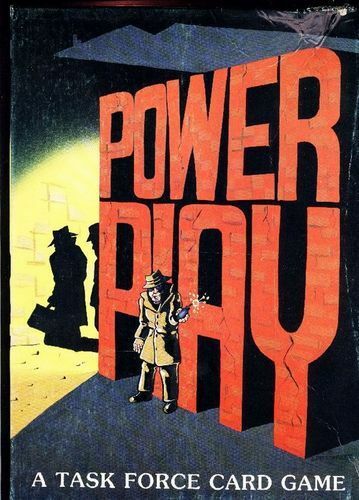 I went to the local video store a lot, and found a 1978 movie called Power Play, about army officers in an unidentified country plotting to overthrow their corrupt government in a coup d’etat. It starred Peter O’Toole, David Hemmings and Donald Pleasence, and its basis was, you guessed it, Luttwak’s book. My game collection was on the other side of the ocean, and so I was inspired to design my very first wargame, about the mechanics of plotting and executing a coup d’etat in an unidentified country. 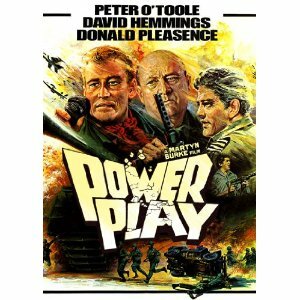 I called it Power Play, in homage to this quite unknown movie (obviously I was not inspired enough to give it a different name!). And a few years later, when I returned home and was starting to use the Internet to broaden my collection and knowledge of the hobby, I found it remarkable to see just how few games touched on this topic. Luttwak defines a coup as: “… the infiltration of a small, but critical, segment of the state apparatus, which is then used to displace the government from its control of the remainder”. Not all coups are led by the military or paramilitary forces of a country, but inevitably they become involved, or their non-involvement has been arranged beforehand. Thus, I feel it is a legitimate topic for a wargame, considering that in the last 60 years armies have been involved in many more coups than in actual wars – and in certain regions of the world coups have changed more governments than elections. What follows are brief descriptions of various civilian wargames which are concerned with the planning or execution of a coup d’etat, or both, in the order of their publication. There once was a British hobby magazine called Miniature Warfare, and for some reason my university library had a magazine file box full of copies on the shelf. In reading an issue from 1970, I found an ad for this game with tantalizing copy, but never heard anything about it again. Through the magic of the Internet, I recently found the game’s designer. This was the only wargame he ever designed, and after 40 years he did not own even a complete copy, but he was kind enough to take some pictures and supply me with some recollections of how the game worked. The game was a rarity even then, and by the standards of what would come after it, rather rudimentary in its approach. It deals only with the execution phase of a coup, in the generic capital city of an imaginary country, but the play of the game poses some interesting choices for the players. Control of certain installations yields control of certain troops, who have advantages and disadvantages of their own, and so on. Its value lies in its being the first attempt to model a coup d’etat. 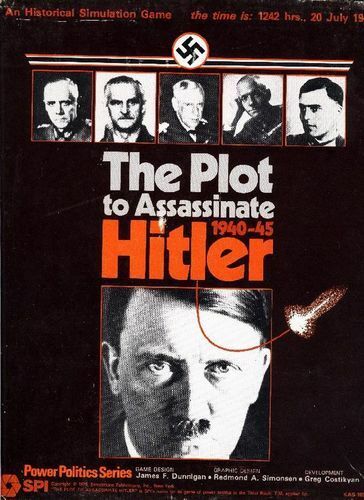 Plot to Assassinate Hitler (PTAH) was the second of three Power Politics Series games to be released by Simulations Publications International (SPI) in 1976-77. The subject of the game is the various attempts on the part of anti-Hitler elements in the German government to assassinate Hitler and seize power. The play of the game sees the Abwehr player (nominally Admiral Canaris, head of the German intelligence service) trying to ‘recruit’ individuals in the Army, civilian government, or even the upper echelons of the Nazi Party to act against the day when he launches his coup d’etat (which he must do, or forfeit the game). The SS player (Heinrich Himmler), for his part, tries to ensure the loyalty of Nazi Party leaders and inconvenience the Abwehr player by investigating and interrogating persons who are in on the plot. All this time, Hitler himself shuttles randomly back and forth between Berlin and his headquarters in East Prussia, like a tin duck in a shooting gallery. The game is climaxed by the Abwehr player declaring a coup, which triggers a different sequence of play as both sides try to decisively eliminate the other as an effective force. The game was not popular with players for a number of reasons. For example, the game map: while it exhibits the old, familiar hexes, it is divided into a large number of areas representing the hinterlands of the German Reich (Russian, Southern France, the Vatican, etc.) on the borders of a single large area representing Berlin. Berlin contains several HQ areas within it which serve as defended localities for the different parties in the game. Thus, having two counters adjacent on the map does not necessarily meant they are physically close to each other, only that they are “organizationally” in contact and able to influence each other. This kind of representation has never gone over well with the majority of gamers – perhaps it is difficult for many people to visualize, accustomed as they are to seeing pieces of Virginian or French real estate tessellated into little honeycombs. Next, the game counters: the units represent highly placed individuals in the complex and fractured hierarchy that was the government of totalitarian Germany. Each unit has an Effectiveness Rating, a Defence Strength, and a Movement Allowance. These three qualities mean different things in different situation: the ER functions like an attack strength, but represents an individual’s ability to organize, coerce or convince other people; the DS is a combination of resistance to coercion, cajoling or just plain slipperiness,; and the MA is the measure of ability to move around in the circles of power and “attack” other individuals, either to sideline them or get them on-side. Almost half the counters in the game are randomizer chits. Players are constantly drawing and tossing these around to bollix up the other player’s plans or advance their own. 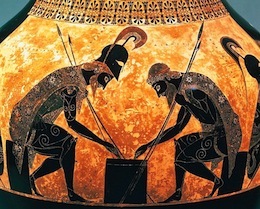 A nice twist is “loyalty chits”: having one of these for a particular character means you are sure of his loyalty (since the other guy obviously doesn’t have it), or it presents an opportunity to recruit him, or it can be used to divert an enemy character who is bothering one of “your” people. I do not think this interesting mechanic was ever used again in an SPI game, though the concept was suggested several times in proposals for other revolution/ spy-themed games. Finally, time is heavily abstracted in this game. There are only eight turns before the Abwehr player must declare a coup, but the period simulated is up to five years long. The outer areas of the Reich start falling under Allied control in turn 6 (D-Day and the Destruction of Army Group Center); apart from that, one turn can represent anywhere from two weeks to two years. The game is climaxed by up to six coup turns, each of which represents only 8-12 hours of action and reaction. Again, this elastic time-sense was something the gamers of 1976 could not readily identify with, although the concept is familiar now. The first game to play up a coup for laughs – by this time enough of them had taken place in Third World countries, deposing one corrupt dictator for another, that even a Woody Allen movie (Bananas) had been made on the topic. In the game, the goal is to stash the greatest wealth in your Swiss bank account. 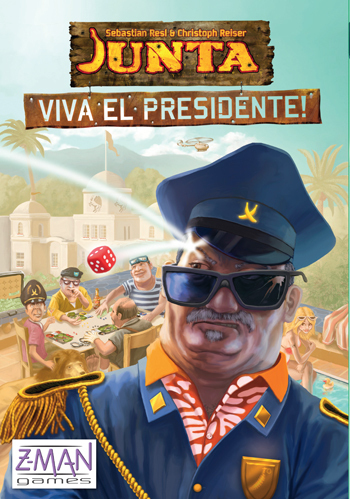 3-7 players representing different officials in the current government depend on “El Presidente” for money, just as the player playing him depends on the other players to stay bribed and support him while he pushes through his budget (and robs the treasury). Players can try to assassinate the other players, taking some of their money by guessing where they will be from among five locations. Players can also stage a coup, whereupon units representing different armed groups are placed on the board and an uncomplicated little wargame is played out to see who gains control over a majority of the power centers. There can often be several coups in a game, and as a result games can be quite lengthy. This game is by far the most popular and available on the topic, and has stayed in print for most of the last 30 years. Another game that plays the coup for laughs, this effort by Task Force Games relies on bad puns and simple graphics to show some of the aspects of power politics in an imaginary country. 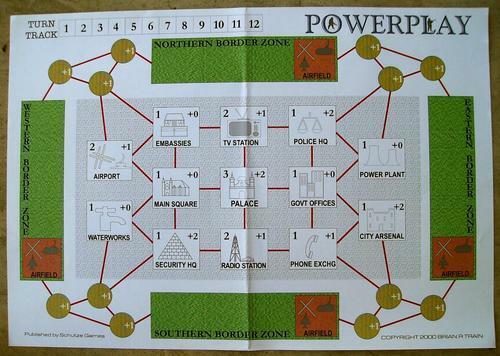 Players receive and play cards throughout a series of turns, trying to establish control over Areas (i.e. sectors of society) by playing Leaders (with punny names, e.g. Mayor K. R. Upshun) from their hands, and rolling the die to take control. Score equal to or less than the amount of Leader influence you have over an Area and it’s yours. When one player feels strong enough, he calls for a Power Play and rolls the die: if he scores equal to or less than the sum of the number of Areas under his control and any “Foreign Aid” cards he has played, then he wins the game. If he fails, then he is out of the game, together will all his cards and any Areas he controlled. Another player will call for another Power Play, same process, and it continues until one player succeeds or all players have lost (one would guess the country then descends into civil war). There is no incentive to strike alliances or make deals, or even plan ahead – essentially, it’s just a simple card game. In an early 1978 issue of The Space Gamer, Metagaming Concepts’ house organ, designer Steve Jackson mentioned that he was working on a Microgame (remember those?) on a coup in an imaginary developing country. It would have made an interesting variation on the science fiction and fantasy titles Metagaming was publishing at the time, but it was not until 1991 that it came out under the imprimatur of Steve Jackson Games. The game concentrates only on the physical aspects of the execution phase of a coup, as military units and mobs duke it out for control of power centres on a map. There is little substance to it, and the game was released long after the market for simple minigames like these had peaked. This game was notable for its small size and speed of play- 50 counters and under an hour, to cover both the planning and execution phases of a coup in an imaginary country. Play in the pre-coup phase is governed by running through a deck of ordinary playing cards (inspired by a scene in the movie where Peter O’Toole and David Hemmings play card tricks on each other while Hemmings sounds him out about joining the plotters). Both sides recruit units to their side and try to interfere with the other’s plans, until the coup is launched and a simple wargame is played out in the capital city. I also devised a “seminar” version of the game for nine players, and recently revised it to make the pre-coup phase a more hidden-information, cloak-and-dagger exercise. 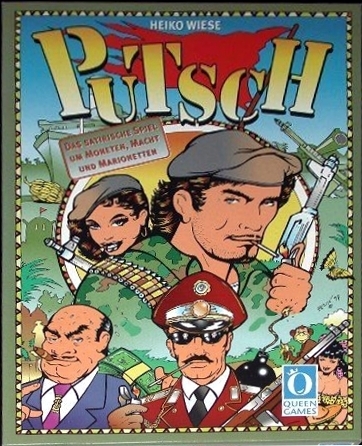 Originally released by Queen Games of Germany. Here the generic banana republic is used as a backdrop for an involved negotiating and card-drawing game for 3-6 players. Bidding, income and budgets get most of the attention in the game, which is won by acquiring victory points derived from controlling groups. 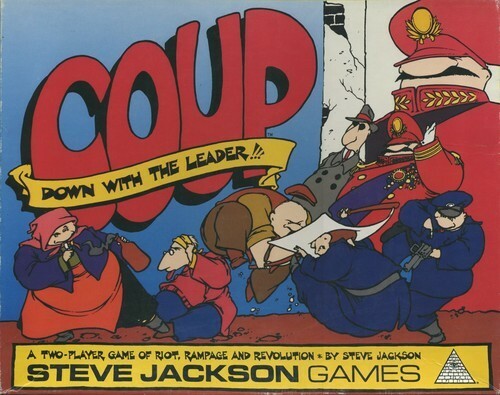 A coup may or may not occur in the game, but no matter – the term is used only to describe an automatic takeover of the government by a military groups. 2010 – JUNTA: VIVA EL PRESIDENTE! 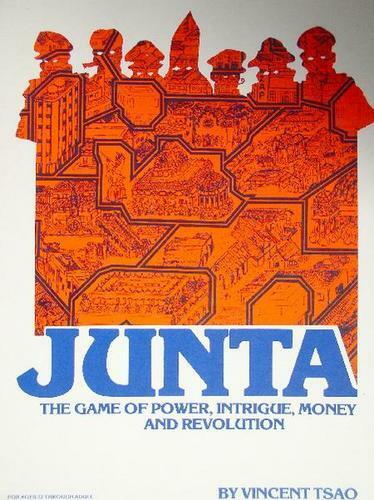 This has been described as a “lite” version of the earlier Junta, and so it is, taking normally less than an hour to play. Players represent generals and corrupt officials who ambush and assassinate each other while trying to siphon off as much development aid money for themselves as possible. The “wargame” aspect of executing a coup has been completely replaced by militia attacks, represented by matching up dice. Yes, that’s all I‘ve been able to find that was ever on the civilian market that focused primarily on the coup d’etat. Of eight titles, in my view only three treat the subject seriously, and none of them are in print. Only one attempts to be a study of an actual historical event, a failed one at that. I am unaware of any computer game that deals with the plotting or execution of a coup in more than a tangential way, or as some kind of external event. The Tropico series of games probably comes closest – a player can select to come to power through a coup when starting the game, which sets certain initial parameters, but more often the game system will pull a coup on the player if he alienates enough of the population. Similarly, examples of professional wargame studies focusing on coups could not be found (there are lots of research papers, though). Spending one’s time modeling or pondering anti-democratic events like this would probably not be officially encouraged and, in certain countries, could even place players under suspicion. Why the lack of interest in this perfectly acceptable pol-mil topic? A primary reason would be just that, it’s a pol-mil topic – and the civilian game market, by and large, does not go in for modeling these things. Also, there’s the nature of the event itself. Ideally the plotters of a well-planned coup would work in complete secrecy and the government would fall before it knew what had hit it. This, or at least the execution phase of the coup, would not make much of a game. The main interest of the event would and should lie in the planning phase of the action, and could make for a fairly tense hidden-information, hidden-agenda multiplayer game. Perhaps I should design such a game. And call it something other than Power Play. UPDATE: There’s now a discussion thread at BoardGameGeek on Brian’s blog post above. Interesting overview. Thanks, Brian. I’m already starting to think about new ways to model coups – particularly something based on the Libyan revolution. 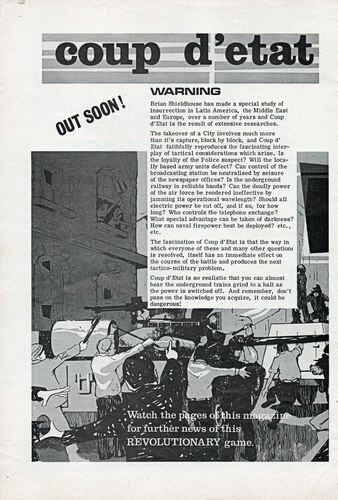 Also, is this the same ‘Coup d’Etat’ – http://1stingames.com/vpasp/shopexd.asp?id=20549 – it mentions that it is from 1966. Thanks very much! If you are interested in collaborating on anything, please let me know (http://brtrain.wordpress.com/). The game you identified is often confused with wargames by its title, but it has NOTHING to do with political coups at all. It is a card game that possibly dates from the French Revolution. I have thought that Libya would make a great game too, although I don’t really think it fits well into the coup d’etat genre–it is far more of a classic insurgency/revolution/civil war. The political challenge in this case would be trying to hold together a diverse rebel coalition amid regional and tribal tensions. 2016 update: Since I wrote this piece, I have worked out two more games on coups. One is a substantial reworking of Power Play, using hidden information and hidden personal agendas in a multiplayer setting (2-5) – I called this one Palace Coup. The other is also multiplayer and has hidden information but a historical setting, it focuses on the execution of the coup against Salvador Allende in Chile in 1973, called unimaginatively enough “Chile ’73”. Not many people seem to be both interested in the topic and inclined to play, so these games haven’t been published yet – but soon I hope. I may well write up a “gaming the Turkish coup” post in the near future, highlighting what sorts of things one might want to include in an accurate simulation. Oh, it’s accuracy you want from me now…. hm. I’ll write something about it at a later date. Second, a game I have designed on the 1973 coup that overthrew Allende, Chile ’73, will be published in 2018 by Tiny Battle Publishing. It features multiplayer play, hidden information, and hidden agendas… this is the game I was planning to design in the final paragraph of the article. And I’ve just ordered Chile ‘73! PnP version also available from the Wargame Vault. By the way, play duration of 150-240 minutes listed on the website is ridiculous unless you break for a big lunch and a siesta in the middle of the game; a better estimate is 45 -90 minutes. It’s a pretty small-format game.